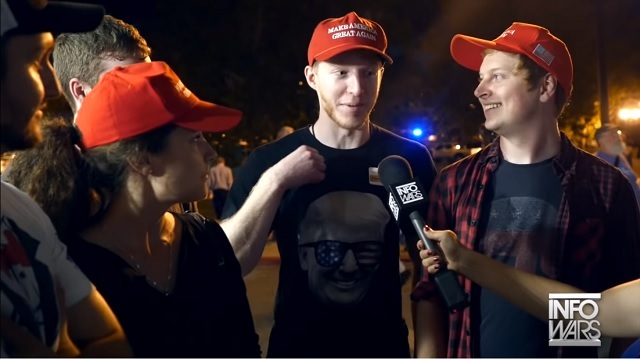 At the packed Trump rally in Johnson City, Tennessee on Monday, Infowars reporter Millie Weaver found a host of Trump supporters saying they're planning to vote in the midterms for the first time ever. "I've never voted in my life," one man in his 30's said. "I'm a business owner, and been struggling for a long time, and it's really turned around in the last couple of years, the economy's great, I'd imagine Trump had something to do with that." Another man said, "To be totally honest with you, I'm 35, but I guess technically I'm still a millennial even though, you know, I don't identify in that manner and I wasn't so politically active until Trump came along, so no I haven't voted before." Another said he's voting for the first time because of all the establishment's "corruption" and "using our intelligence agencies" for "politically motivated" ends. A middle-aged man told Weaver he's voting "to keep folks like Maxine Waters and the rest of the tribe out of power." "All the crazy people!" his young daughter interjected. Asked if they think there will be a "Blue Wave," one young man said, "I think the blue wave actually isn't going to happen because all of the moderate Democrats are going to flee because of the social wave that's going on." He pointed to his friend who exclaimed, "I was a Democrat, Trump changed my mind!" According to a report Tuesday in The Hill, a record 800,000+ people "registered to vote last week on National Voter Registration Day, setting a new record for the annual event." The previous record was 771,321 set in 2016. Register to vote today through Vote.GOV.